Quartz countertops? Are you kidding? Own a home long enough and you are likely to redo your kitchen at some point. Redo your kitchen and you will need new countertops. Buy new countertops and you will discover the choices aren’t so easy anymore. Maybe we have too many choices. Here is one more for you and this should be near the top of your list if your budget goes to the high end. Why is it worth considering? There are some functional reasons why it is a better product, and some aesthetic reasons why it is more likely to provide what you want in your renovation project. First the functional. Quartz countertops (often generically called Silestone countertops) are made from loose quartz bonded together with a resin. It turns out, when you do this right, you end up with a non-porous surface. That means nothing will soak into the countertop. Granite is slightly porous. There will be areas where some liquids will seep into your granite countertop. For this reason granite countertop manufacturers recommend that you seal the granite periodically, about every six months. Quartz is also harder than granite. It is less likely to be scratched. Now granite is a lot harder than Formica or even Corian, but it can still be scratched. With quartz you are less likely to end up with a scratched countertop. Quartz is heat resistant, but this is one area where granite outshines quartz. However, in neither case should you put hot pans directly on the countertop. The danger is not scorching the surface but creating a thermal shock which can crack either granite or quartz. Quartz countertop manufacturers are also claiming that they have a lower emissivity product. Say what? It turns out that some granite comes from areas of high radon and may be releasing radon gas into your kitchen. There is a concern about radon these days because research has implicated it in lung cancer. Household radon levels are a health concern. Quartz, being non-porous, doesn’t have the same radon concerns. While I expect that most of the radon issue for granite countertops is a bunch of hooey until the manufacturers start certifying their product as radon free Silestone and its compatriots will continue to get credit as being a cleaner product. The leading brand of quartz, Silestone, includes an anti-microbial agent in its resin. The result is a surface that resists bacterial infestations. 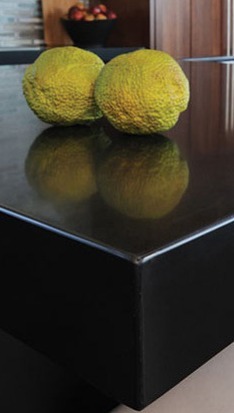 Since granite is porous some bacteria can take up residence in the countertop. You can kill this off with good cleaning practices, but Silestone 1) won’t let the bacteria take up residence (since it isn’t porous) and 2) will kill off any that try survive on the surface. This probably makes it the healthiest countertop product on the market. A little blurb from a Silestone fact sheet lays out their sanitary claims. Now for the aesthetic reasons. Quartz countertops, being engineered by man, can be designed in just about any color. Quartz naturally comes in a variety of colors, but the resin binders can also be colored. Granite is a natural material and the patterns, while varied, are still limited to what nature provides. If you are looking for countertops in grays and browns that may not mean much, but if you are looking for something more in the line of a blue or a red or a yellow the Silestone is probably your best bet. Quartz countertops come in a variety of colors. 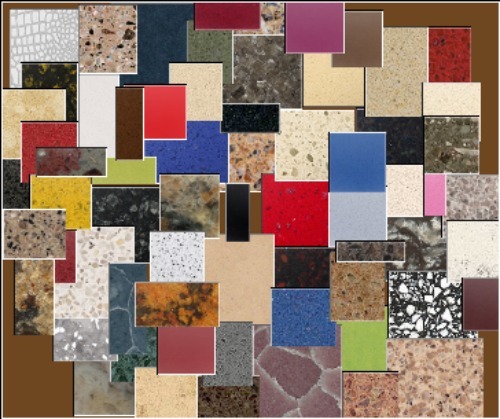 Here is a sampler pulled from the websites for Cambria, Ceasarstone, Zodiaq and Silestone countertops. Most of the quartz countertop style options mimic either marble or granite. There is a pattern of swirls or grains that create interest and allow for an interplay of colors. They have also come up with some patterns that you would not find in nature, at least not in rock. Some manufacturers also offer quartz countertops with a smooth, monochrome surface. This gives quartz a greater breadth of textures and colors than can be found in granite. I mentioned that the leading brand is Silestone. They spent a boatload of money in advertising to get into that position. As a result the name has become synonymous with quartz, rather like Formica was for laminate countertops. They own about 50% of the market in the United States. They are owned by an Italian company named Cosentino. Another Italian company, Breton, owns the patent for the process, and all the manufacturers pay Breton a Royalty. You’ll also find a major American company, Dupont, in the middle of the fray. Their brand is Zodiaq. Another company, Cambria, boasts 100% U.S. production for their Quartz countertops. Whoever makes the product it will be installed by a local retailer or craftsman. They will measure your kitchen, design the counter, order the countertop material, and install it. As with any such product, a good craftsman can make a big difference in the success of the installation. Silestone costs around $40 a square foot to around $60, but some competitors will run closer to $80. Installation will run about $5 to $10 a square foot. Quartz countertop prices will vary with the complexity of the job and the market in your local area. Thickness, and edge finishes will also affect the price. A variety of edge treatments are available for the different brands. At a price, of course. Granite probably is less expensive on the low end. There are more retailers offering the product and more manufacturers churning out granite countertops. Price competition gives you a better chance of getting granite at a great sale price, but there is also a somewhat wider range of quality in granite. Silestone costs are independent of individual deposits of quartz. Compare that to granite which is always tied to a certain location for a certain look. This can constrain supply driving prices up. I am not saying that there is a lack of granite, or of marble. But, if you are looking for a particular texture of granite there might be a limited amount. Say that you see a particularyly beautiful granite and you decide that it is perfect for your kitchen. You might be surprised to find out that the price for that particular granite is much higher than normal because it comes from far away, and it comes from a very small quarry producing very small amounts. That situation is not likely to face Silestone countertops or Zodiaq countertops or any of their competitors because they are made from a collection of quartz crystals compressed together with a binder. This is a designer blend and the individual components are mixed and matched and not tied to one particular crystal or one particular location. Quartz countertops are usually a glassy surface, but they also come in a honed finish. This gives it a low-gloss matte finish. In some cases it looks really good, but the honed surface gives a little bit of porosity on the surface and this can allow for stains to develop. I am not sure that all the manufacturers had this problem but it is something to look into before you commit to a honed surface. Silestone also manufactures complementary products, like silestone cabinet pulls and silestone sinks. Having cabinet pulls that match your countertops is pretty cool idea, and another reason to put Silestone on your list of kitchen countertop materials to consider. To summarize, Silestone countertops ( and Zodiaq countertops, and Cambria countertops and Ceasarstone countertops) are harder, easier to clean, easier to maintain, and offer a wider selection of colors and textures. However, the Silestone brand alone stands out for its inclusion of antibacterial agents that keeps your kitchen countertops free of germs.